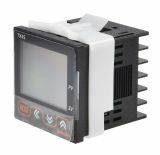 Temperature controller TX4S-24R, 100~240VAC, -100~1700°C, Cu50, Pt100, J, K, L, R, S, T, relay+2 alarms The TX4S-24R thermocontroller is a microprocessor controller with high efficiency, suitable for temperature measuring and maintaining. It is widely used in industrial facilities for gas, liquids and hard substances temperature detection and maintenance. Temperature controller TX4S-14C, 100~240VAC, -100~1700°C, Cu50, Pt100, J, K, L, R, S, T, analog current/SSR+alarm The TX4S-14C thermocontroller is a microprocessor controller with high efficiency, suitable for temperature measuring and maintaining. It is widely used in industrial facilities for gas, liquids and hard substances temperature detection and maintenance. Temperature controller E5CS, 220VAC, 0 -400°C, type K, relay output E5CS is a microprocessor, highly efficient and reliable controller measuring and maintaining temperature. It is widely used in the automation of manufacturing processes for monitoring and contoling the temperature in solids, liquids and gases in the machine-building, chemical and other industries, in the production of ceramics and others. Temperature controller E5CS, 220VAC, 0 -999 °C, type K, SSR output E5CS is a microprocessor, highly efficient and reliable controller measuring and maintaining temperature. It is widely used in the automation of manufacturing processes for monitoring and contoling the temperature in solids, liquids and gases in the machine-building, chemical and other industries. Temperature regulator, VTR-96C4, 220 VAC, 0° C to 999 °C, thermocouple type K, with relay output VTR-96C4 is an electronic measuring and maintaining temperature device used to automate manufacturing processes, maintenance and reporting of temperature in solids, liquids and gases. Temperature regulator, VTR-96C4, 220 VAC, 0° C to 400 °C, sensor Pt100, with relay output VTR-96C4 is an electronic measuring and maintaining temperature device used to automate manufacturing processes, maintenance and reporting of temperature in solids, liquids and gases. Temperature controller VTR-900CS, 220VAC, 0-600°C, Pt100, relay output The VTR-900CS temperature controller is a microprocessor controller with high efficiency, suitable for temperature measuring and maintaining. It is widely used in industrial facilities for gas, liquids and hard substances temperature detection and maintenance. Temperature controller, VTR-900CS, 220 VAC, from 0 °C to 1200 °C, for thermocouple type K, relay output The VTR-900CS temperature controller is a microprocessor controller with high efficiency, suitable for temperature measuring and maintaining. It is widely used in industrial facilities for gas, liquids and hard substances temperature detection and maintenance. Thermocontroller, VTR-5000, 220 VAC, from 0 °C to 600 °C, for thermocouple type K, relay output The VTR-5000 thermocontroller is a microprocessor controller with high efficiency, suitable for temperature measuring and maintaining. It is widely used in industrial facilities for gas, liquids and hard substances temperature detection and maintenance. Temperature Regulator, VTR-5000, 220 VAC, from 0 °C to 400 °C, sensor Pt100, relay output The VTR-5000 thermocontroller is a microprocessor controller with high efficiency, suitable for temperature measuring and maintaining. It is widely used in industrial facilities for gas, liquids and hard substances temperature detection and maintenance. Temperature controller VTR-700CS, 220VAC, 0-400°C, Pt100, relay output The VTR-700CS Thermo-Controller is a microprocessor, highly efficient and reliable, to measure and maintain temperature. It is widely used in the automation of production processes for temperature reading and maintenance in solids, liquids and gases in industry. Temperature controller VTR-700CS, 220VAC, 0-400°C, TC type J, SSR output The VTR-700CS thermocontroller is a microprocessor controller with high efficiency, suitable for temperature measuring and maintaining. It is widely used in industrial facilities for gas, liquids and hard substances temperature detection and maintenance. Temperature regulator, E5C4, 220 VAC, 0° C to 999 °C, thermocouple type K, SSR output E5C4 device is an electronic measuring and maintaining temperature device used to automate manufacturing processes, maintenance and reporting of temperature in solids, liquids and gases. The socket is not included in the price! Temperature controller, E5CS, 220 VAC, 0 ° C to 400 ° C, thermistor type Pt100, SSR output Temperature controller, E5CS, 220 VAC, 0 ° C to 400 ° C, a thermistor type Pt100, SSR output. Thermocouple type Pt100 (sold separately from the controler). As their name suggest, temperature controllers are instruments used for measuring and maintaining temperature levels and are widely used for different household and industrial purposes. 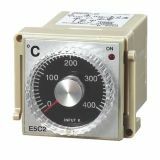 Thermo regulators are required and useful when an object need to be cooled, heated or both, or just to be kept at a specific temperature value in any environment conditions. Also, they are used to automate the manufacturing processes, to maintain and monitor the temperature at accurate levels for solids, liquids, gases, etc. Their working principle is based on comparing the temperature measured by the thermo-sensor (typically a thermocouple or RTD type Pt100) with the desired value set by the user or a setpoint. If there is a difference between the two values, the ​​thermocontroller activates a circuit on its output/outputs and trigger an additional device/devices. The basic principle for differentiation of automatic regulators is the called Law of regulation. The main and most frequently used in practice are four. Thermal regulators with two positions law of regulation : also known as ON/OFF. This is the simplest, but also the least precised way to measure and control the temperature. Three position controllers: usually they trigger two relay outputs which manage more than one device or enforce the same device to work in different modes. Another types are thermostats with proportional adjustment or (P Law ): this law allows regulation with significantly higher precision, because with appropriate adjustment of the device can be achieved a smooth approach of the regulated variable to the set one, while preventing its excess . Thermostats with proportional - integral - differential law of regulation (PID / PID Act) : by this way of management can be achieved optimum precision and accuracy. 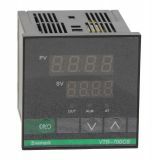 Vikiwat Ltd. is a direct importer and distributor of a wide range temperature controllers with excellent quality and competitive prices.